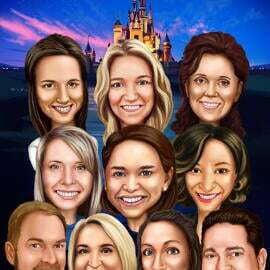 Support your husband, wife, friend or colleague with a full color caricature, drawn from photo with pencils in honor of Retirement Day or Farewell. Do not leave your person without care and support in difficult moment. Caricatures, which are designed for special people, are able to rise spirit as well as cause a smile on a person's face. We want to make your person pleasantly surprised as he or she always dreamed to be. We can draw your person with a custom background, as for example it can be a recognizable backyard, barbecue party, fishing or hunting spot. Mention all of your ideas in the requirements box below and our artist will try to visualize them precisely. Pencil Drawing will be delivered as a ready to be printed JPG File to your Email by default. It is also available to deliver your caricature as Printed Photo, Printed Canvas or Original Drawing on A4, A3 Paper. Worldwide shipping.